Wednesday, November 22, 2017 Nic Butler, Ph.D.
It’s Thanksgiving season again, and for most people that means a day of rest, relaxation, and feasting with close friends and family. As a historian working in an old city, I have learned that Thanksgiving also includes at least ten people asking me the same question: “When was the first Thanksgiving in Charleston?” I don’t mind the question at all, but the answer is generally more complex than most people care to hear. If you don’t mind a quick stroll through the historical record of early South Carolina, however, I’m happy to offer an answer to this annual holiday question. First, let’s start with the most basic definition of the subject. Thanksgiving is a day, specifically a “holy day,” set aside to give thanks—for our family and friends, for the necessities of life, and for the bounty we might enjoy beyond the bare necessities. In short, the roots of Thanksgiving are religious in nature. In twenty-first century United States, however, Thanksgiving is, for the most part, a secular holiday with mild to strong religious overtones, depending on your point of view. Nevertheless, it’s important to recognize that this holiday is firmly rooted in the religious practices of the European men and women who crossed the Atlantic Ocean to settle this nation. The English, French, Spanish, German, Portuguese, Dutch, Swiss, and other people who ventured to the New World brought with them a host of traditions and practices that shaped the cultures of many different colonies, now nations. Regardless of the national differences among these settlements, in each it was common for the “commander-in-chief” to issue a proclamation, at least once a year, setting aside a specific “holyday” or “holiday” for quiet reflection. That is to say, a day for people to refrain from all work and to focus their thoughts and prayers on a specific topic. Such proclamations might occur at any point during the calendar year, and might occur more than once a year, depending on what was happening in the local community. Furthermore, there were two distinct types of these public “days of reflection,” as we might call them, in early America. The first type was the “day of fasting and humiliation,” which generally followed some disaster or unfortunate event, such as an epidemic, a destructive hurricane or fire, an earthquake, or a military defeat. The second type was the “day of prayer and thanksgiving,” which generally followed some fortuitous event, such as a military victory, a quiet hurricane season, or a bountiful harvest. The tradition of Thanksgiving existed long before the creation of the United States, and it wasn’t just celebrated by the “pilgrims” of early Massachusetts. Spanish explorers in the Americas, for example, celebrated an annual day of thanksgiving in the early 1500s. French adventurers who settled briefly at Parris Island, South Carolina, celebrated a day of thanksgiving in 1564. English settlers at Jamestown, Virginia held a day of thanksgiving after their safe arrival in 1607. In short, the concept of setting aside an annual day for prayers of thanksgiving was a very common, international practice in the New World during the Age of Discovery. With these facts in mind, let’s return to our original question. The first settlers of the English colony of Carolina arrived here in 1670 and established their headquarters at Charles Town, on the west bank of the Ashley River. When was their first public celebration of thanksgiving in Charles Town? I regret to say that I’m not quite sure of the exact date, owing to the incomplete nature of the records of our early government here. If you’ll permit me to hazard an educated guess, however, I’d wager that the first English settlers who arrived at Charleston in the late spring of 1670 celebrated a day of thanksgiving before the end of that year. They probably didn’t celebrate and relax right away because they needed to build shelters and plant crops, but perhaps six months later, say, in November 1670, after surviving the initial adventures associated with launching a new colony, I suspect they finally treated themselves to a day of rest and thanksgiving. If you think about the calendar of events that took place during the early years of South Carolina’s history, you’ll find plenty of opportunities for celebrating public days of thanksgiving: In the autumn of 1671, for example, when a hurricane deterred a Spanish plot to destroy the tiny English settlement at Charleston; and again in the autumn of 1686, when another hurricane prevented Spanish forces from destroying Charleston (after raiding the nearby islands of Port Royal, Edisto, and Wadmalaw). The surviving records from these early years of South Carolina are rather slim, but, considering the pervasive tradition of observing days of thanksgiving, I’m pretty confident that our commanders-in-chief, the early governors of this colony, would have proclaimed public days of prayers and thanksgiving on a regular basis. If you’d like to search for evidence of other days of thanksgiving in the early history of Charleston, there are two different ways you could approach the topic. First, you could troll systematically through the surviving records of our early government looking for instances of the governor issuing a proclamation for the public observance of a day of thanksgiving. Before the mid-1800s, however, such proclamations occurred at different times of the calendar year, so there’s no way to predict when days of thanksgiving might have been celebrated. Alternatively, you could start with a list of important events in the history of our community and then consult the surviving records to see if there are corresponding proclamations. For example, days of public thanksgiving generally followed military victories, be they local or distant. In 1745, for example, Charleston gave thanks for the British victory over the French at Cape Breton; in 1776, we gave thanks for the American victory over the British at Sullivan’s Island; in 1815, we gave thanks for the conclusion of a peace treaty with Britain after our “Second American Revolution.” You get the idea. Name an event that impacted the entire community, and in its aftermath, you’re likely to find a proclamation ordering the public to observe a day of thanksgiving. As I mentioned a moment ago, the early notion of the “day of thanksgiving” was a moveable feast, if you will, that might be held at any point in the calendar year. Furthermore, this “day of thanksgiving” was customarily proclaimed at the local level—by the governor of a colony (later state governors) or the mayor of a city or town. Immediately after the formation of the Federal Government of the United States of America in 1789, however, our presidents—beginning with George Washington—also got into the habit of proclaiming public days of national thanksgiving. Around the middle of the nineteenth century, it became increasingly common for our presidents to proclaim a day of thanksgiving in the autumn months, a habit that reflected the New England tradition of an annual harvest celebration. It was President Abraham Lincoln who established the custom of placing this national holiday in late November of each year, but, contrary to some assertions, he did not create the modern concept of Thanksgiving. I started this conversation as an attempt to answer the question, “when was the first Thanksgiving in Charleston?” Now that you know the facts surrounding this topic, I hope you’ll understand that there are actually several ways to answer this question. The Native Americans who inhabited this area long before the arrival of Europeans may have observed their own sort of annual festival of thanks, for which we have no records. The earliest known “day of thanksgiving” in South Carolina was observed by French soldiers at Parris Island in Beaufort County in the year 1564. English settlers probably paused for a day of thanks shortly after establishing Charles Town on the Ashley River in 1670. 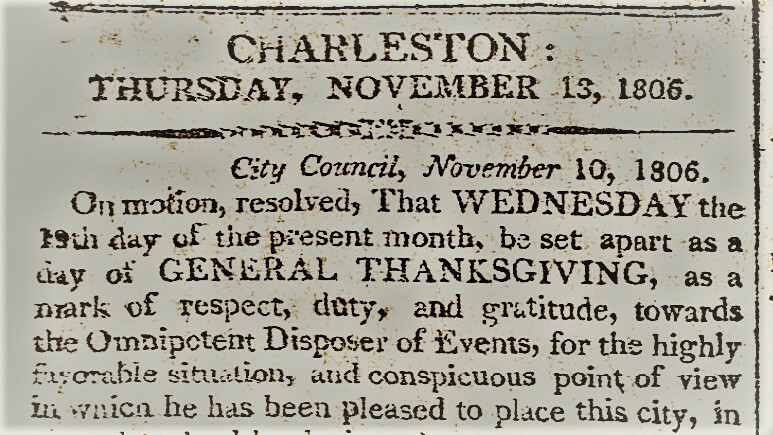 The earliest recorded instance of a day of public thanksgiving in Charleston (that I know of) took place on 17 October 1706, to celebrate the survival of South Carolina in the face of invading enemies. And finally, the first celebration of the modern national holiday known as Thanksgiving Day took place on the third Thursday of November 1941, when everyone else in these United States celebrated that fixed national holiday for the first time. The idea of setting aside one day each year for rest, reflection, and the expression of thanks, has its roots in European religious traditions that came to the New World centuries ago with the earliest explorers. Out of these frontier, colonial societies, the wielding of that tradition became vested in the commanders-in-chief our colonies, then our states, and finally in our national presidents. What was once a religious tradition gradually evolved into a secular tradition, and later became enshrined in law as a national holiday. Thanksgiving Day, the third Thursday of every November, is now an official part of the calendar of the United States, but it doesn’t belong to our nation exclusively. At its root, the concept of breaking bread with our family, friends, and even strangers, is a tradition that we share with all nations of the world. Happy Thanksgiving, everyone!